To enter the $100 Visa Gift Card Giveaway click here. If you would like to tap into some heart warming reading, just go ahead and read the giveaway entry comments. sincere words. I have so enjoyed reading them. On to the recipe….which is…. As I type this post in the late night hours…I am wishing I were feasting on this delectable, heavenly pie this very minute. This pie is so delightful I invited it to both my dessert plate, and then to my breakfast plate the next morning. Why I am admitting this flawed behavior to you, I do not know. I guess that’s the sort of thing a girl burning the midnight oil is willing to share. It was only one morning you know. I’ve enjoyed a sturdy piece of whole wheat toast every morning since, just for the record. And now, just for the fun of it I am about to reveal yet another of my many flaws. Consider it Double Confession Delight…..
A couple of days ago my TeenSonMark brought me the phone. On the other end, asking to speak to me was my daughter BlondeEmily. She was calling from a friends house with a very urgent matter. “How about Asian.” was my reply. “Um…..” came the reply “Well, no. Actually, I don’t think you do Mom.” she simply stated. And that’s what you have here folks. A Double Confession, from a Pie Lovin’, Miss-spelling, gal. Addicted to Blueberry Sour Cream Pie. Seriously addicted to Mr.Spell Check. 1. In a large mixing bowl, or in a stand mixer beat the cream cheese until smooth. 2. Add the powdered sugar and vanilla and mix well. 3. Add the sour cream, cool whip and dash of salt. Mix until well combined, and set the mixture aside. 4. In a medium sized sauce pan mix the cornstarch and sugar together. 5. Add the water and lemon juice and stir until smooth. 6. Get that sauce pan on the stove top and turn the heat to medium. Stir in the blueberries. If you are using frozen blueberries, just pop them in the microwave for a couple minutes so they aren’t ice cold when you add them to the sauce pan. 7. Bring the mixture to a boil, stirring constantly. It should thicken up after a couple of minutes. You want it to be the consistency of canned pie filling. 8. Remove the pan from the heat and stir in the dash salt, vanilla and butter. 9. Set it aside to cool. 10. Pour the cream filling into a pre-baked pastry crust. When the blueberry topping is cooled to room temperature spread it over the filling. Cover with Plastic Wrap and refrigerate for at least 2 hours. Note….this pie can easily be made a day ahead. Enjoy! totally addicting cheesecake….coming up next! Oh my I want some now,,it looks so good and I will have to give it a try,,,also gotta love teenagers,,I have raised 4 and it never changes..have a great weekend..
Jaime….I just love your “confession” (I soooo get your love for spell-check!) AND I adore, adore, adore this fabulous looking pie!!!!! Bring on those wonderful bb's from my freezer just calling for a recipe….happiness!!! Do you create your own recipes??? 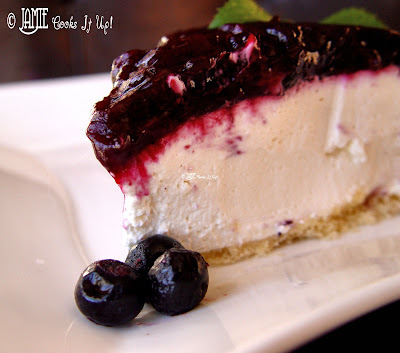 Blueberry Sour Cream Pie is my most favorite…ever! This recipe is much easier than the one I have,so I will be giving it a whirl. I do enjoy a good piece of pie (or slice of chocolate cake) for breakfast every now and then,myself. I do believe that the blueberry topping counts for a serving of fruit (at least in my book)! Double Holy Cow! I whipped this delicious pie up for dinner tonight! It was a huge hit. Child #1,#3,and #4 licked their plates clean (literally! ), and they should all know better,too. I, of course, set a good example and waited until everyone left the kitchen before I licked my plate clean!!! Thanks for another great recipe. Ah, just in time. My hubby's birthday is on Friday and he loves the blueberry sour cream pie Marie Calendar makes. I'll be making this for his birthday. Thanks for the recipe! ahahahahah loved the story about your daughter! I was just talking about sour cream blueberry pie with my sisters the other day! My sister is making one for Thanksgiving – I'll have to forward her this recipe! Looks DELICIOUS! Can you switch up the fruit? Say frozen strawberries or raspberries? I haven't ever tried it with different fruit. Not sure if it would come out perfectly, considering strawberries and raspberries have a little different texture and juice content than blueberries. This is, however just a guess. It may work well. Let me know if you try it, and how it turns out. I feel like trying it myself! Raspberries would be heavenly. Good luck! Made this for Thanksgiving and it was wonderful! I like your site layout and the pructies are so awesome .. the color you are able to capture is so vivid and true. Great work! I have been blogging myself and really enjoy it. I have all the ingredients for this pie, EXCEPT blueberries, lol. It calls for a homemade pie filling to go on top, so would a canned pie filling work? I'm sure it wouldn't taste as good, but is canned pie filling any good? Sorry for my slow response! Your comment got a little bit lost in the shuffle. This pie would still be quite good with canned pie filling, however it is a bit expensive. If you look for frozen blueberries this time of year they may just be cheaper than the canned filling. Good luck! That looks fabulous. Do you think it work with a graham cracker crust? It would be great with a Graham cracker crust! Hope you love it! My boyfriend isn't a blueberry fan, but we've made this with raspberries and a frozen berry mix, both came out awesome. It was the most popular pie at our last thanksgiving. I love this recipe! Made it for christmas but switched it up a bit by making tarts instead of pie. Everyone raved about them. Starting another batch or two for a charity bake sale this weekend. They are sure to be a hit!!! Do you think the filling would make a good filling and icing for an angel food cake??? Then decorate with berries?? Wow, that is a clever idea. This filling might be a bit too concentrated to use as an icing. However, I haven’t ever tried it…and it may work out great. Let me know if you give it a go! I must be the only one in the world who doesn’t like cool whip! Have you ever made it with regular whipped cream instead of non-dairy whipped topping? Granted, it might be more calories, but….it is the holidays! Real whipping cream would be fabulous in this recipe. 🙂 Let me know if you try it and how it turns out! I am so pleased to find your blueberry topped cream pie. I am certainly going to use these pies for some holiday meals. I am so happy Sam’s usually has fresh blueberries and strawberries year around. Now, if we could get fresh home-grown tomatoes year around that would be awesome. So my wife Brooke just featured your recipe today on her website All Things Thrifty, and I clicked over here and lo and behold I saw who the Jamie behind the cooks it up is! I had to call my wife right away and tell her who you are and that I know you from Murray, and that you are Ali’s sister! Thanks for the recipe it was delicious. What a coincidence! I am indeed Ali’s sister. Is your mom the Julie Ulrich I worked with at The Lion House? 🙂 Please thank your wife for sharing my recipe with her readers! Here from All Things Thrifty and this looks delicious! I may try with vegan cream cheese. You’re funny too! You posted this a few years ago and ever since it has been a family favorite!! I wanted to tell you that I love the recipe…DELICIOUS, however, I couldn’t get all of it into your basic 9″ pie plate. I wanted to ask if this recipe is for a deep dish? After putting in the filling I couldn’t even get half of the blueberry mix on top. Please advise.